SkinCare Physicians is not your ordinary dermatology practice. It is one of the leading academic dermatology institutions in the country. Our physicians actually produce more publications than the majority of the university based dermatology programs around the country. 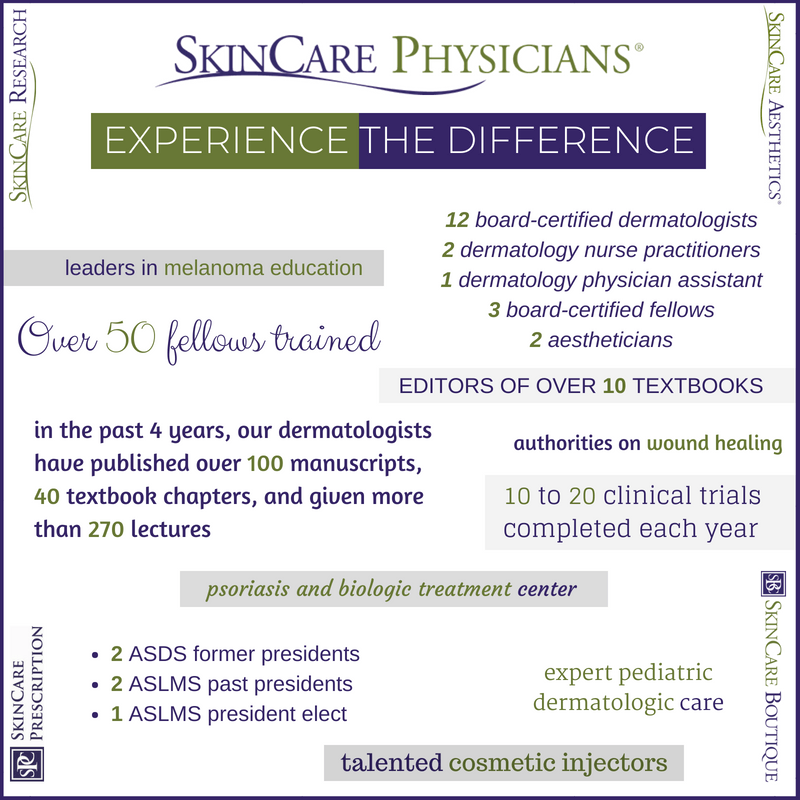 Over the past four years alone, our board-certified dermatologists have published well over 100 manuscripts, 40 textbook chapters, and given more than 270 lectures around the country and internationally. They have also been the editors of 10 textbooks and serve as associate editors to several of the most prestigious journals in dermatology and dermatologic surgery. Furthermore, SkinCare Physicians’ research department runs 10 to 20 clinical trials each year and helps to advance the fields of dermatology and aesthetic medicine. 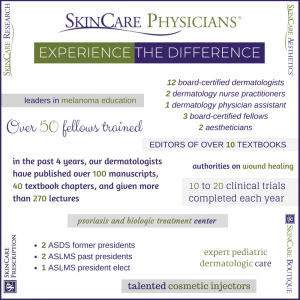 In addition to contributing academically, SkinCare Physicians also helps shape dermatology by training many of the future leaders of the specialty. Each year, SkinCare Physicians trains three dermatologic surgery fellows. These fellows have already completed their residency training and are board-certified in dermatology. They spend a year with us doing research and honing the finer skills of our surgical and aesthetic procedures. Not only do they continually inject life to our office, they also contribute to the science of our specialty and help advance it forward. We have now trained over 50 fellows at SkinCare Physicians. A large proportion of our former fellows continue to be involved in academic medicine and some have now even started their own training programs across the country. We are very proud of our current and former fellows as they take what they have learned at our center around the country and the world. Several of the physicians at SkinCare Physicians are also very involved in the national organizations that shape dermatology and dermatologic surgery. Drs. Dover and Rohrer have both served as president of the American Society for Dermatologic Surgery (ASDS). Drs. Arndt and Dover have both served as the president of the American Society for Lasers in Medicine and Surgery (ASLMS) and Dr. Rohrer is now serving as Vice President of the organization and will become the president in 2020. In addition, many of our former fellows play leading roles in these national organizations and have been elected to their board of directors by their peers. In the recent ASLMS election, 4 of the 7 physicians elected to office were from SkinCare Physicians! These remarkable achievements underscore the reputation SkinCare Physicians has on a national level. Finally, many of our physicians devote their time and talents to advance specific areas of dermatology and skin care. Dr. Kaminer has been central to the research and development of many innovative noninvasive treatments, such as for the treatment of cellulite, adipose tissue and skin tightening, and is a member of or chairs many of their medical and scientific advisory boards; Dr. Travers has long been enthusiastically involved in education and leadership about melanoma, was recently honored at their annual Gala, and just completed running in her 13th Boston Marathon on their behalf; Dr. Sobell is an international authority on psoriasis and biologic treatments, conducts multiple clinical trials on these drugs, and heads the SkinCare Physicians Psoriasis Care Center; Dr. Sikora has interest in and is a consultant to several skin care and cosmeceutical companies, and has developed the SkinCare Boutique; Dr. Kim has become the co-director of the SkinCare Physicians training program in Mohs micrographic surgery; Dr. Morton is involved in several of our clinical research trials, and is integral to crafting important SkinCare Physicians communications such as our annual newsletter. Dr. Phillips is an authority on skin aging and medical dermatology, particularly with regard to wound healing, and has received numerous awards and prizes for her research; Dr. Kane is an expert on pediatric skin care and infectious disease manifestations in children and an author of a textbook on pediatric skin disease. As a patient of SkinCare Physicians, you can be assured that in addition to being served in our beautiful patient-centered facility, you will be receiving the absolute highest standard of care with the most state-the-art technology available in the country. Since our dedicated and passionate physicians are involved with so much of the research behind all of the rapidly evolving technologies and techniques in aesthetic medicine, they are best suited to customize and tailor your treatment to achieve quality results and optimize the natural looks you deserve. Visit our dermatology practice near Boston and experience the difference.